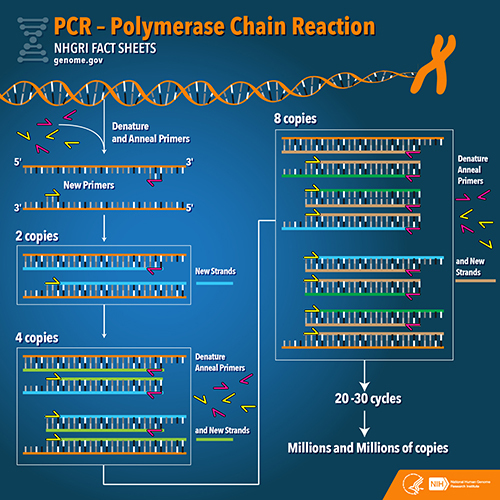 The influence that the polymerase chain reaction (PCR) has had on modern molecular biology is nothing short of remarkable. This technique, which is akin to molecular photocopying, has been the centerpiece of everything from the OJ Simpson Trial to the completion of the Human Genome Project. Clinical laboratories use this DNA amplification method for infectious disease testing and tissue typing in organ transplantation. Most recently, with the explosion of the molecular diagnostics field and meteoric rise in the use of next-generation sequencing platforms, PCR has enhanced its standing as an essential pillar of genomic science. Let’s open the door to the past and take a look back around 35 years ago when we started reporting on the relatively new disciplines of genetic engineering and molecular biology. At that time, we were among the first to hear the buzz surrounding a new method to synthesize and amplify DNA in the laboratory. In reviewing the fascinating history of PCR, we will see how the molecular diagnostics field took shape and where it could be headed in the future. The biological sciences rarely advance within a vacuum—rather they rely on previous discoveries to promote directly or indirectly our understanding. The contributions made by scientists in the field of molecular biology that contributed to the functional pieces of PCR were numerous and spread out over more than two decades. It began with H. Gobind Khorana’s advances in understanding the genetic code, leading to the use of synthetic DNA oligonucleotides, continued through Kjell Kleepe’s 1971 vision of a two-primer system for replicating DNA segments, to Fredrick Sanger’s method of DNA sequencing—a process that would win him the Nobel prize in 1980—which utilized DNA oligo primers, nucleotide precursors, and a DNA synthesis enzyme.